Flightpath were commissioned as Architects for this project that replaced 15 outdated pensioner flats with 20 new single bedroom dwellings and site landscaping. The project has transformed the street appearance, adopting a contextual approach reflective of neighbouring allotment sizes and detached dwellings. The project features orthogonal building grouping, detached dwelling scale and form and typical garden setbacks. The Chapman Road appearance was conceptualised as three separate dwellings in appearance reflecting the prevailing streetscape pattern. The base dwelling unit has been grouped in fours with one front door evident from the street. The two detached dwellings to the rear of the site (northern side) are also aligned with dwellings along Chapman Road to reinforce that principle. The appearance evolved through the consideration of environmentally sustainable design principles of north facing buildings encouraging cooling flow through breezes. Hipped roofs with similar pitching heights to residences west of the site and wide eaves overhangs combine with modern, local building, sustainable materials to produce a residential development with contemporary Australian character. Residential style materials typical to the Mansfield Park character of have been selected. The material palette delivers a robust residential vernacular. External walls have a double face brick plinth with horizontal galvanised custom orb cladding above. 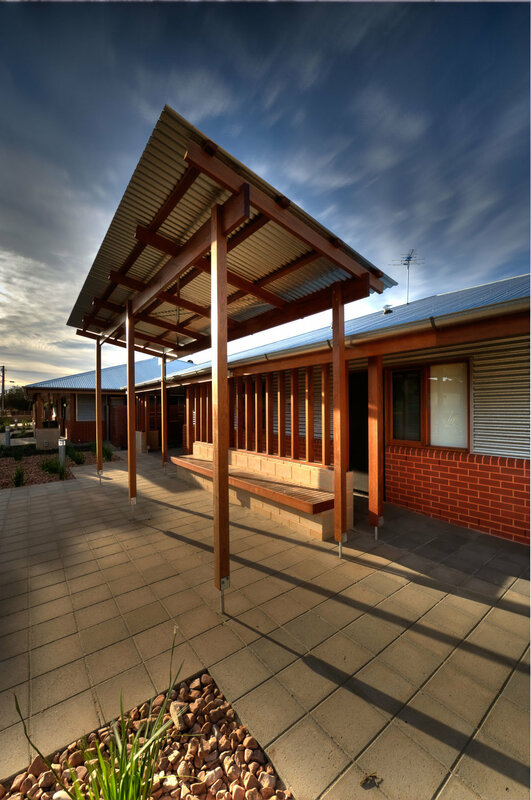 The custom orb cladding was constructed on a reverse brick veneer wall in accordance with good environmentally sustainable design principles that maintain consistent internal temperatures through high thermal massing. 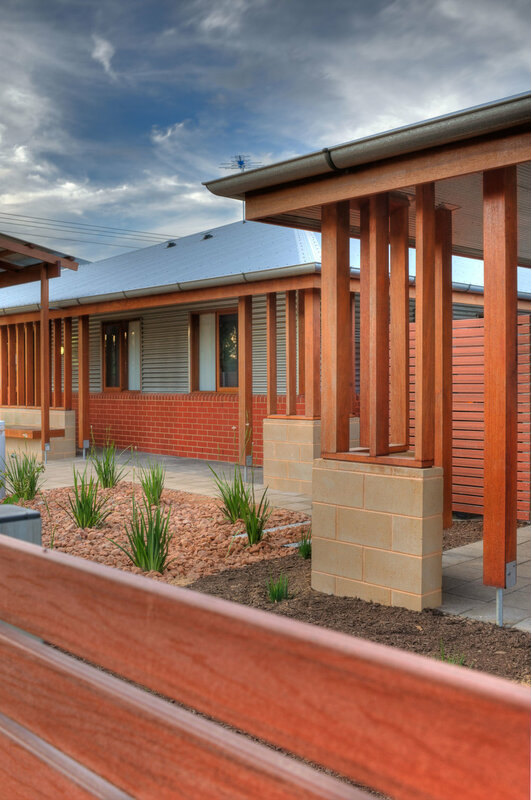 Roofing to the dwellings is timber framed with galvanised custom orb cladding with matching gutters, downpipes and roof trim.All external timber has been selected on the basis of its certified appropriate sourcing and durability, finished in a penetrative wood stain finish including doors, windows, columns, fascias and exposed verandah framing. Buildings are grouped around a central courtyard, which provides shelter and privacy for the occupants. Boundary fencing along June Street and Chapman Road is a combination of rendered masonry and durable recycled plastic slatted fencing to provide a composition of solid and a degree of screened transparency commonly found in front gardens. The landscape design reinforces the strong geometry of the built form and incorporates paving materials, pebbled swales and native species for low water usage and maintenance. Stormwater has been detained on site and reused. The composition of these elements has been based on the original site boundaries between blocks to further reinforce the rhythm of regular block size found throughout the suburb. 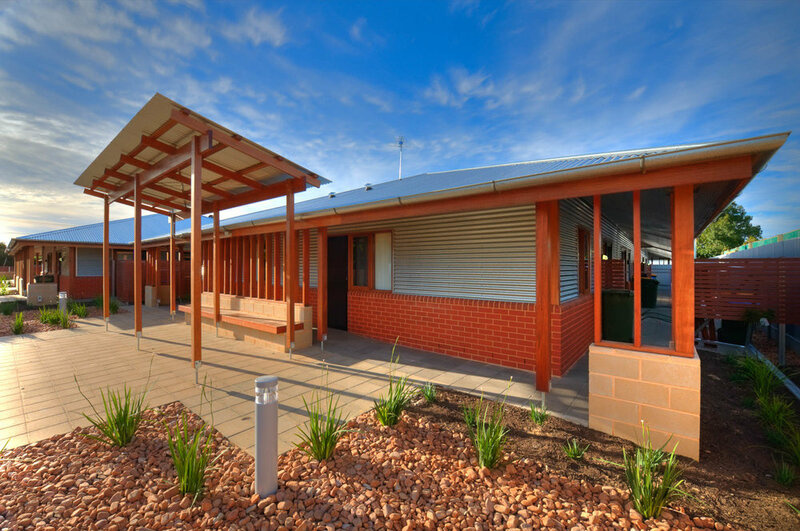 Engineering input was provided for the design of floors, stormwater harvesting and detention, roof trusses. Secon provided design guidance on photovoltaic cells and solar hot water services. The project is important demonstration of affordable housing based on an aesthetic founded in context, simplicity, repetition of components, sustainability and use of low cost materials, assembled in an innovative way. The project has also delivered to the client a dwelling design that fits with their clients needs and expectations fitting within the Desired Character of Mansfield Park.